This application is focused on the study of microstructure of sample which shows the decomposition of W-10Cr-1Hf (solid solution W-Cr with HfO2 particles) as a result of annealing at 1000 °C for 10 hours. The pores are formed around the hafnium dioxide particles and grow due to the decomposition, also Cr – rich part (dark lamellae or dots) and W – rich part (bright area between the lamellae) are constituted. Using CPEM, it is possible to quickly and accurately distinguish the topographic and the material contrast in SEM images. It is also possible to easily distinguish the grains of Hf from the pores. It was found out different etching rate of the sample surface by CPEM technique. 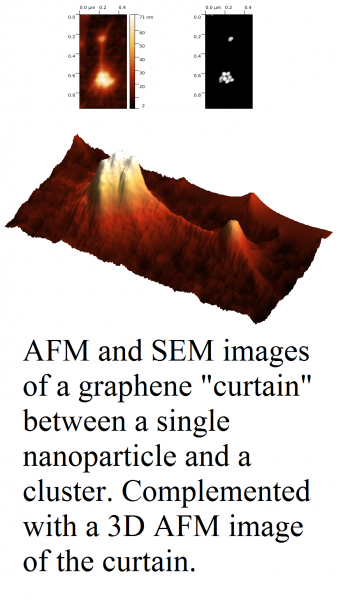 AFM image, SE image (BSE detector) and CPEM image of sample. Published with courtesy of Institute of Plasma Physics AS CR. Collagen scaffold was prepared by friendly freeze drying method (Ceitec BUT, RG 2.3). Then, the scaffold was seeded with mesenchymal stem cells and was incubated under standard culture conditions for 6 days (Department of Histology and Embryology, Masaryk University). Finally, the scaffold was stained with osmium tetroxide and uranyl acetate for better visualization. It was possible to carry out measurement of prepared cells only due to unique LiteScope™ and its precise AFM tip navigation by SEM without damaging the probe in the pores of scaffold. Using CPEM, it was possible to scan the same cell with both the electron beam and the probe and obtain the images. These images are then used to obtain topographic information about the cell and its interaction with the substrate in the meaning of greater spreading of the cell after the scaffold - better adhesion and a more friendly environment. 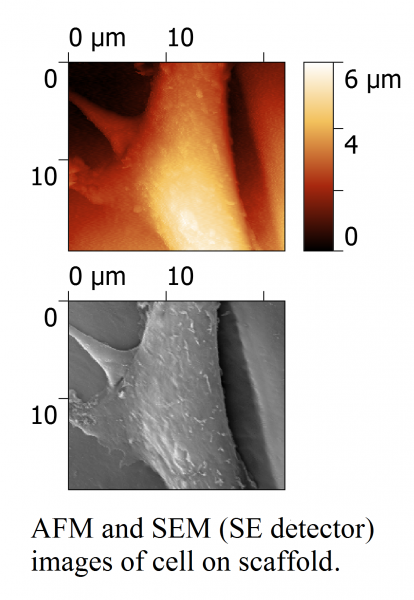 AFM image with profiles and SEM image (SE detector) of cell on scaffold. White cast iron (etched) – lamellar pearlite structure. Anisotropic silicon wet etching through concentric circles mask. Surface topography of textured PIN diode on glass substrate – solar cell. Electron beam lithography – silicon wet etching. 3D AFM Topography of fine-grained 9% Cr steel reinforced with fine yttrium oxide. 3D visualization of FIB milled structure - gradient spiral phase plate. Surface of sintered rutile - thermally etched and polished. Crack propagation in metallic sample after cyclic loading. Surface topography of polished metallographic section after FIB etching. FIB etched structure in 100 nm gold on silicon substrate.